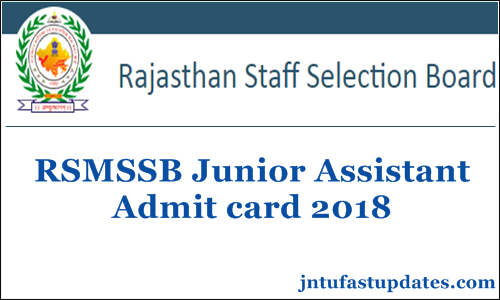 RSMSSB LDC Junior Assistant Admit Card 2018 Download: The Rajasthan Subordinate and Ministerial Services Selection Board (RSMSSB) is going to organize the written test for LDC/Junior Clerk on various date on August 12th and 19th and will be held in two shifts- from 8 AM to 11 AM and 2 PM to 5 PM. The Next exam will be conducted on September 9th and 16th. Aspirants applied for Lower Division Clerk posts in Rajasthan can download RSMSSB LDC admit card 2018 to give the examination. Applicants can get their respective admit cards from the RSMSSB official portal, rsmssb.rajasthan.gov.in. All the applicants are instructed to strictly download the hall ticket as it is the most important document to attend the exam. Examination authorities will not allow the candidate to the examination if they do not show the admit cards at the entrance. So, aspirants who are going to appear the LDC examination must download admit card and keep it safe to carry it while going to the examination. Check more guidelines, exam dates, hall ticket availability date and other information from the following. Rajasthan Subordinate and Ministerial Services Selection Board (RSMSSB) is the state-government board of Rajasthan that carries out various state government related works. This organization announces various jobs every year for the eligible aspirants seeking to get government jobs in the state. This year the organization has come up with a large number of jobs for Jr clerk and LDC posts. The RSMSSB has notified 11,225 LDC posts this year. Lakhs of hopefuls having the suitable educational standards and eligibility have responded and applied during the application dates. The application process was recently completed for the announced posts. Aspirants have to qualify in written test and interview rounds to get shortlisted for the LDC/Jr. Clerk posts in Rajasthan. The organization is going to conduct the RSMSSB LDC written test on 12th, 19th August, and 9th & 16th September 2018. Hence candidates can download Rajasthan LDC Admit card to continue with the test. RSMSSB has scheduled the Lower Division Clerk (LDC)/ Jr Clerk on 12th, 19th August and 9th, 16th September. Aspirants applied for RSMSSB Jr. Clerk posts can download the admit cards/call letter/hall ticket before 10 days of the examination, probably. Candidates applied for LDC posts in Rajasthan can download admit cards from the official website, rsmssb.rajasthan.gov.in. Visit the portal on a frequent basis to download the admit card. Applicants can download RSMSSB LDC admit cards from 3rd august. Soon after the release of hall ticket, candidates can download and check the details of their examination venue, date, and timings from it. Also, applicant’s details such as name, date of birth, father’s name, signature, scanned photograph etc will be mentioned on the admit card. After downloading it, candidates can clearly check all details once. If any spelling mistakes were there on admit card, candidates can contact the RSMSSB authorities through email, or helpline numbers. How to Download RSMSSB Lower Division Clerk/ JA Admit Card 2018? Search the RSMSSB LDC/Junior Assistant Hall Ticket download link in organization website. Check the information in RSMSSB LDC Hall Ticket 2018.